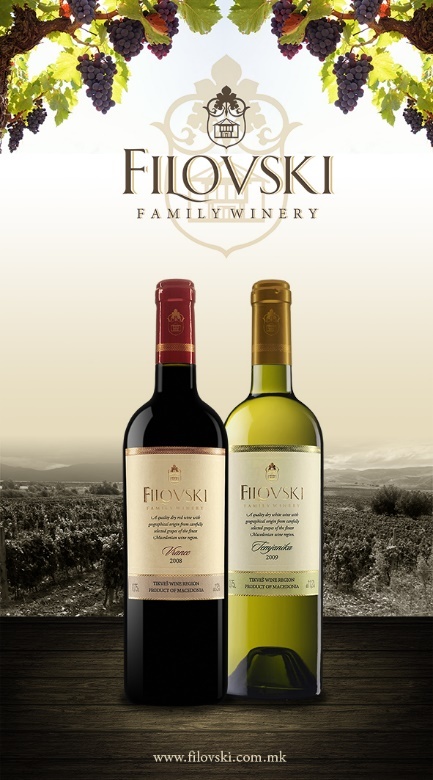 Founded in 2005, by Zarko Filovski and his sons Nikola and Paskal, this family winery is located in the village of Prždevo (Przhdevo), in the sun enriched hills east of Demir Kapija. The winery has a capacity of 100,000 liters. The boutique winery crafts three wines, a Temjanika, Vranec and Vranec Reserve (Unifiltered). Temjanika is the local name for the Muscat Blanc à Petits Grains (Moscato Bianco, Muscat de Frontignan) varietal and the winery produces a quality dry and refreshing white with luxurious citrus and floral aromas. The Vranec, aged for 6 months in American Oak barrels, deep dark ruby in color, is a structured and well-balanced red rich in dark forest fruits.